Bro. 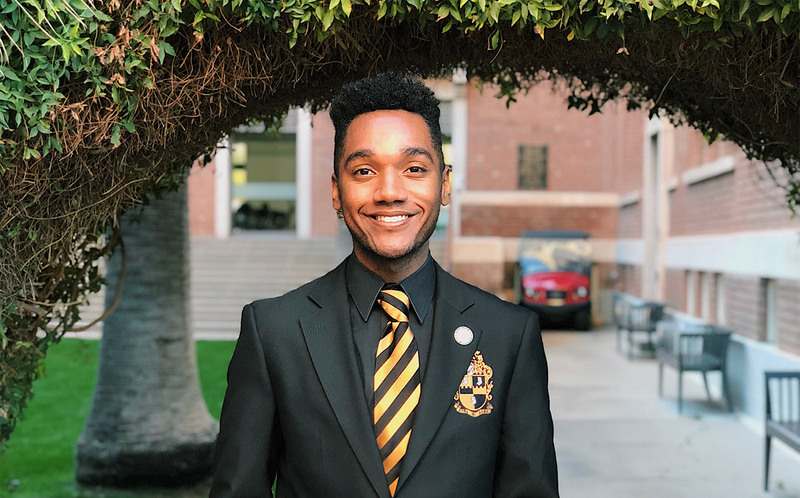 Peyton is a Spring 2017 initiate of Alpha Phi Alpha Fraternity, Inc. via the Zeta Theta Chapter seated at the University of Arizona in Tucson, AZ were he maintains an impressive GPA of 3.935. Brother Peyton is currently a member of the Honors College majoring in Neuroscience and Cognitive Science with a Neurobiology emphasis and minoring in Biochemistry. Bro. Peyton has been an attendee or delegate for the 2017 & 2018 Tri-State District Conference, 2017 & 2018 Western Region Leadership Academy & College Brother Retreats and the 2017 & 2018 Western Region Conventions. Prior to his appointment to WRAVP, Bro. Peyton has also served as the Assistant Area Director for Arizona and was most recently awarded Tri-State District honors for College Brother with the Highest GPA and Most Outstanding College Brother. He also serves in many leaderships positions and organizations across the University campus, including Vice President of Chain Gang Junior Honorary, E-Board member of Alpha Epsilon Delta Pre-health Professional Honorary, Elgie. M. Batteau Honor Society member, B.L.A.C.K. Student Mentor, Coalition of Black Organization Leader, and Fraternity and Sorority Programs Representative.